BIG SALE!! 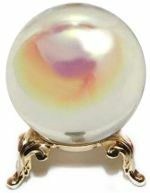 CRYSTAL BALL IN JEWEL COLORS BIG SALE!! 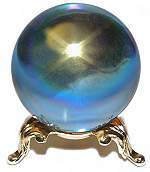 Beautiful Aqua AB Crystal Ball in 50mm or 2" diameter. Bring the soothing Blue Sky into your bedroom. 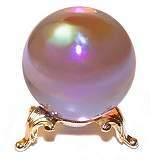 This high quality Crystal Ball has a golden rainbow Aurora Borealis coating which gives a mesmerizing jewel effect. Shown with Princess Gold Plated Stand on sale separately, now $4.50. 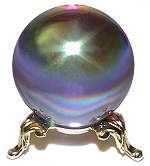 Beautiful Aurora Borealis Crystal Balls, 50mm or 2" diameter shown here. Capture the rainbow and take it home.. The Aurora Borealis is a clear crystal ball with a lovely rainbow coating which reflects infinite variations of light and color depending upon position and light source. Shown with Princess Gold Plated Stand on sale separately, now $4.50. 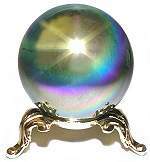 A gorgeous Emerald AB Crystal Ball in 50mm or 2" diameter. The Lush Green of Summer all year round. 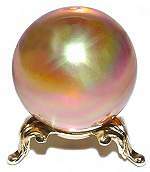 This high quality Crystal Ball has a golden rainbow Aurora Borealis coating which gives a mesmerizing jewel effect. Shown with Princess Gold Plated Stand on sale separately, now $4.50. 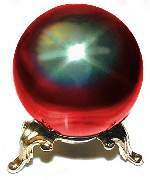 2nd quality Alexandrite AB Crystal Ball in 50mm or 2" diameter with small flaw in AB coating. These are very rare and are now discontinued. artificial light! 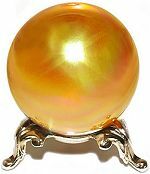 This high quality Crystal Ball has a golden rainbow Aurora Borealis coating which gives a mesmerizing jewel effect. Shown with Princess Gold Plated Stand on sale separately, now $4.50.